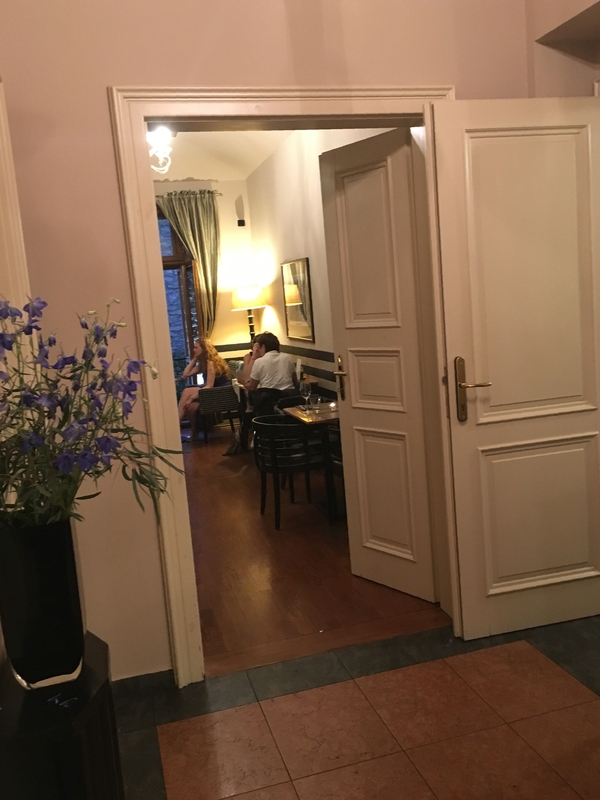 Café Lounge is a cosy place, just a few steps away from the tram stop ‘Ujezd’ (castle side of the river in Prague). The entrance looks almost like a hotel; you could easily think from the name and initial glance that this is just a café that provides sandwiches and coffee. But step inside and you’ll find a fine-dining restaurant with friendly but professional service. The interior of the restaurant is modern, but cosy. At the rear, there is a small garden with several tables. One feature of the garden is a large, high wall. This is relatively unusual within the cloisters that are formed by the design of most buildings in Prague. Apparently, this is called the ‘Hunger Wall’ and was built by Czech King Charles IV. The wall looks a bit re-constructed, but adds something to the garden, especially in the evening when it is nicely lit with uplighters. We visited on a Wednesday evening in May and sat outside. I didn’t see any wasps and even with lights on after dark there weren’t swarms of midges or mosquitoes. 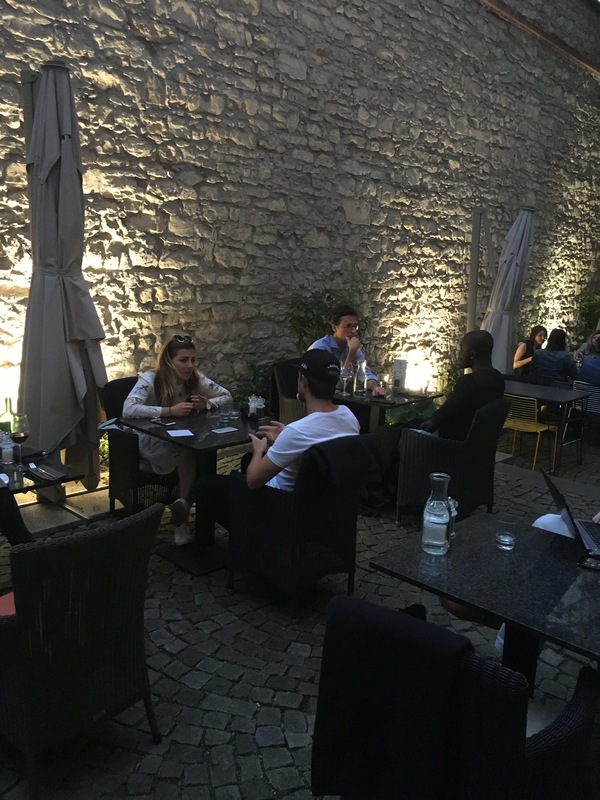 With the high wall on one side and the restaurant wall on the other, this would be an ideal place to screen in and make bug free. 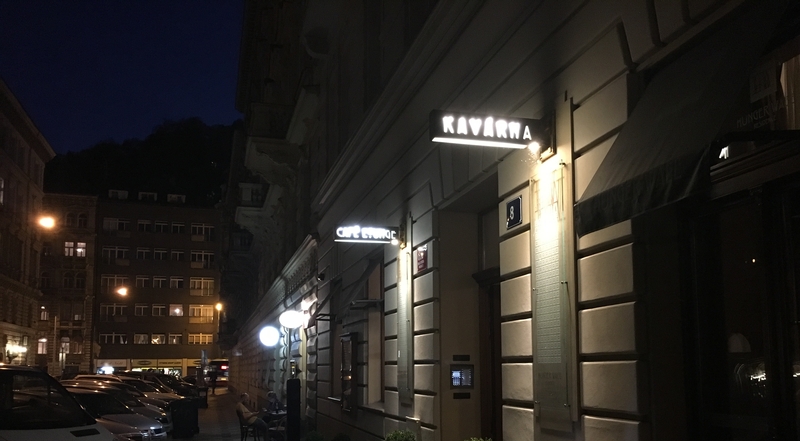 When we last visited several years ago, there was an ornate pre-printed table mat (well A3 paper) with information about the restaurant and an artistic impression of its location in Prague. We didn’t see that this time – if that has gone then it’s a shame. The wine list is a little odd – the majority of the wines you probably wouldn’t recognise. Plenty of German and Austrian wines which I avoid – probably because of the memory of Liebfraumilch in the 1980s. Our waitress announced that she was also the sommelier and was more than happy to talk us through the wine list. But people tend to be creatures of habit and have their favourites like Malbec, Chablis, Rioja and Merlot. We had the Unlitro 2015 Ampeleia, Roccatederighi, Toscana (IT) for 650Kc which was fine, but I would have rather paid 650Kc for one of my regular favourites. We were given a carafe of water and fresh focaccia bread with olive oil. The carafe was also refreshed when empty. There was a charge of 20Kc showing the Czech for ‘side dish’ on our bill – I’m not sure if that was the water or the bread, but I’m fine with that. To start we had Beetroot Ravioli (115Kc per) which turned out not to be pasta, but pieces of beetroot folded like ravioli with a ricotta filling. It was nice enough, but I was looking forward to ravioli. Ravioli doesn’t refer to the shape, it refers to the pasta – the chef probably thinks this is clever, but I don’t think the menu should mention ravioli. Our main was one of two specials (there isn’t an à la carte menu for mains); cod with chickpea mash and asparagus (310Kc per) – this was pretty good, fresh and perfectly presented, but missing that wow factor, considering the chef only had two dishes to focus on. As the Unlitro wine was literally ‘a litre’ rather than 70cl, we decided to share a cheese plate (210Kc). There was a really good selection of Czech cheeses, plus some delicious apricot, pumpkin and ginger chutney. This time we didn’t have coffee. But I’d recommend the coffee from my previous visit, as it’s presented with a great deal of theatre, or perhaps a science experiment. A vintage coffee percolator is set up at your table; gas burner underneath and spherical glass container with another glass on top of that. The heated water rises through a central tube to fill the upper glass. Then they waiter adds coffee and that filters back down into the spherical container. Our total bill 1730Kc plus tip. Would we go back? Would I recommend this place? I really like the décor, the garden and the service. I like sitting outside there on a warm evening. But then, I don’t really like the wine list and the food isn’t as impressive as it should be for the price. As you can probably tell from this review, I want to love this place but we’re not quite compatible.